Oliver Jones is the second greatest jazz pianist to emerge from Canada. Of course Oscar Peterson is the greatest. So for most of his career Jones has lived in that shadow. This doesn't seem to bother Jones. I'm sure he is asked about this in interviews. And he even got to perform one of Peterson's greatest songs Hymn To Freedom with the master himself. Jones was born Sept. 11, 1934 in Montreal. His parents were from Barbados. Jones studied piano and played at Montreal's Union United Church which is the home of the famed Montreal Jubilation Gospel Choir so he worked with them a lot and he played local clubs. In the early 80s he led the house band at Biddle's in Montreal owned by bassist Charlie Biddle. Jones' debut album was recorded at Biddle's and it was also the first time he recorded Hymn To Freedom. It was on Justin Time Records. He still records for them. He also recorded Hymn To Freedom on the 1991 album A Class Act. The DVD Serenade was taped live at the 2004 Montreal Jazz Festival. I'm sure Jones always wanted to perform with Peterson. But after his 1993 stroke, Peterson was limited in what he could do on the piano. So as you can see in the video clip, Jones is carrying most of the load. It doesn't matter. It's great to see them on stage together. Most of the DVD features Jones' trio of Dave Young on bass and Norm Marshall Villeneuve on drums. For the two songs with Peterson, Young is replaced by Peterson's usual bassist Niels-Henning Orsted Pederson and guitarist Ulf Wakenhuis. Jones is 83 years old and at a recent tribute show in Montreal, there was talk that it might be his final appearance. The 2017 documentary Mind Hands Heart details his road to retirement. But I would not be surprised if he changes his mind and performs a few times. Oliver Jones is a legend in Canada. He can do what he wants. 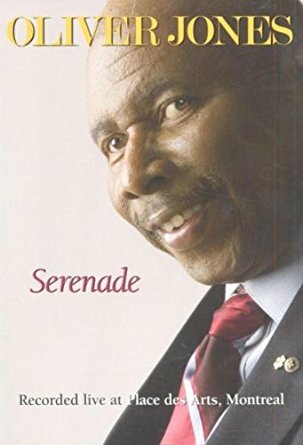 Here's Oliver Jones featuring Oscar Peterson performing Hymn To Freedom at the 2004 Montreal Jazz Festival from the DVD Serenade.